Explanation: What are black hole jets made of? Many black holes in stellar systems are surely surrounded by disks of gas and plasma gravitationally pulled from a close binary star companion. Some of this material, after approaching the black hole, ends up being expelled from the star system in powerful jets emanating from the poles of the spinning black hole. Recent evidence indicates that these jets are composed not only electrons and protons, but also the nuclei of heavy elements such as iron and nickel. The discovery was made in system 4U1630-47 using CSIRO’s Compact Array of radio telescopes in eastern Australia, and the European Space Agency's Earth-orbiting XMM-Newton satellite. 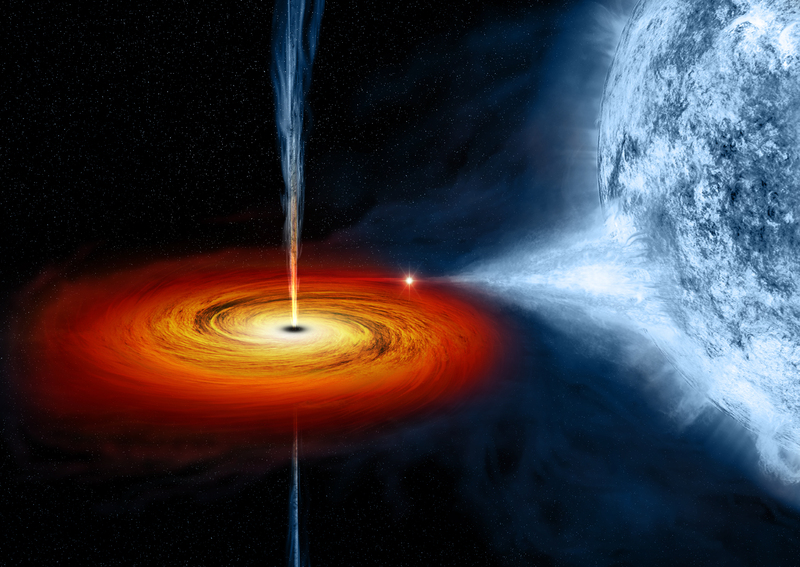 The 4U1630-47 star system is depicted above in an artist's illustration, with a large blue star on the right and jets emanating from a black hole in the center of the accretion disc on the left. Although the 4U1630-47 star system is thought to contain only a small black hole -- a few times the mass of our Sun -- the implications of the results may be larger: that black holes of larger sizes might also be emitting jets of massive nuclei into the cosmos.